Corporal Louis E. Laird from the U.S. 101St Airborne Division prepares to jump from a doorway of Douglas C-47 Skytrain military transport aircraft during dress rehersals for the Normandy invasion, Spring 1944. Although a staged photograph, the paratrooper is equipped as he would be for the Normandy drop. The trooper has an M1 Rocket Launcher ('bazooka') slung over his left shoulder. Visible behind his reserve parachute is his Griswold Bag, which holds his M-1 Garand Rifle. Hanging underneath his reserve is a M1936 Canvas Field Bag, which would contain the trooper's personal item. 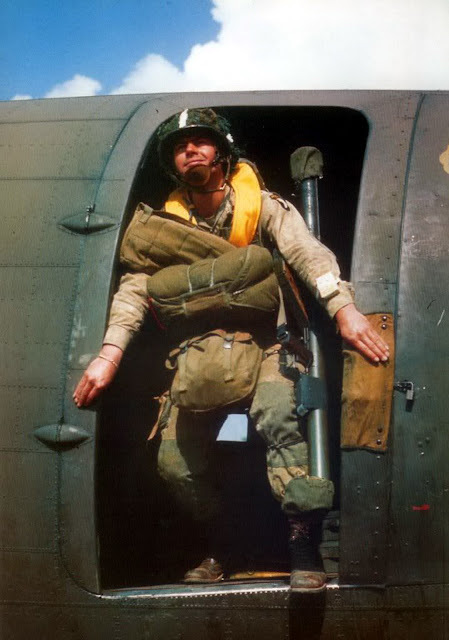 In World War II, the American paratroopers were the only airborne forces issued with a reserve chute! They were all volunteers, many men who could have been NCOs in other units volunteered as privates in the Airborne. All officers, NCOs and ranks shared the same training together. They won their Jump Wing after five training jumps. Many were killed or injured during training, even before they face the real enemy! 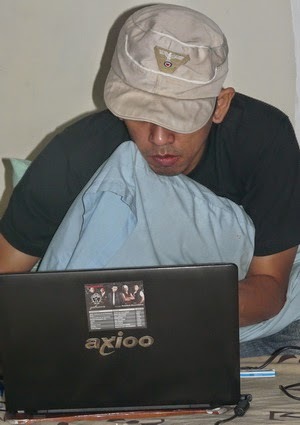 Other picture from the same sequence.